Your life is so much more than a task list! 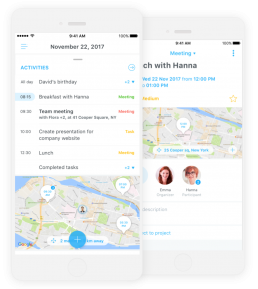 blueskyme grew out of “frustration” with corporate apps that for those of us who care about planning our days and achieving our goals, NS cannot get a complete view of our day. You can simply see your entire day, and practically navigate the entire app, from the Do screen alone. Study your time booked activities (a.k.a. meetings) and your tasks for the day to check your load. See where you need to be in a map and get an overview of who else you are engaging with that day. Then review which projects (goals and objectives) you are working towards. We all have to make priorities and sometimes react based on urgencies. Simply convert any Activity to another type by tapping the top of the detail screen. Pull any screen to search and filter your data. blueskyme retrieves and connects the information you have in G-Suite and presents it as usable as possible. blueskyme provides additional features compared to G-Suite. You can add metadata such as Time Focus, start and end dates, and see Activities linked to your contacts. Other small and helpful features such as letting you change types for Activities. You can create a task and later change it to a meeting. blueskyme will keep this in sync with G-Suite. Any changes you make in blueskyme will be reflected in your Google Services, or stored on your device if Google for the bsm data not supported by Google. Plan your activities by Time Focus and dates. Be on top of your time! View your activities by time focus. Move items to today or free up your day by moving activities that are not to be done Today to Next. Or simply schedule them if you know when they need to take place. Review your quickly logged Activities (from Quick Add) in Collect and plan them out. Set priorities and Time Focus. Using Quick Add and Collect ensures you do not forget anything. Review daily, or the night before. Be on top of your game! 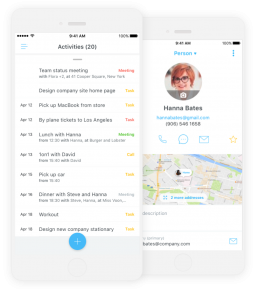 The Do screen is your personal dashboard in blueskyme. This view gives you a complete view of what, where, when, and who for your day. 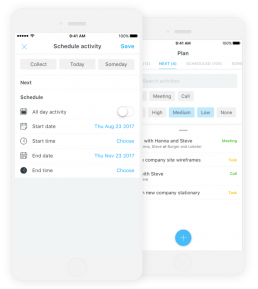 A navigable calendar is immediately available by swiping down and lets you navigate your calendar by day. Navigate to all your Activities, all your Contacts, or all your Projects directly by a simple tap on this screen.